"Aspera Hiems Symfonia! 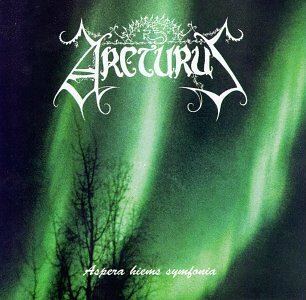 is the debut full-length studio album by Norwegian black metal act Arcturus. The album was originally released through Ancient Lore Creations in 1996. Four out of eight tracks on the album are re-recorded tracks from the "Constellation (1994)" EP. The lineup has changed a bit since the release of the EP though. Skoll is now credited for playing the bass and neo-classical influenced guitarist Carl August Tidemann (Winds) is also featured in the lineup. The latter´s playing style has a great impact on Arcturus sound compared to the early releases by the band. The music is symphonic black metal with lots of neo-classical keyboard and guitar elements. The vocals by Kristoffer "Garm" Rygg (Ulver, Borknagar) are both raspy and clean. The music is very atmospheric and mostly mid-paced. There´s a strong melodic foundation in the material and compared to other contemporary and more harsh black metal acts Arcturus were definitely one of the more polished acts on the scene. The musicianship are strong and while the sound production isn´t that well sounding (The album would be re-mastered and re-released on the "Aspera Heims Symfonia/Constellation/My Angel (2002)" compilation album with an improved sound quality), it´s not a major issue for the listening experience. "Aspera Hiems Symfonia" is overall a decent quality symphonic black metal album and if you enjoy other artists in the polished, neo-classical tinged, and keyboard driven part of the black metal genre this one will probably be right down your alley too. The compositions are intriguing and the musicianship strong, but the sound production does bring my rating down a bit. A 3 star (60%) rating is warranted.